Oswald Veblen loved buildings. 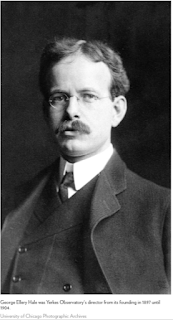 He largely designed the first home for the Princeton University math department--the original Fine Hall--and as the Institute for Advanced Study came into being soon thereafter, his persistence ultimately overcame IAS founding director Abraham Flexner's resistance to building a home for the IAS. That love of buildings may have been inherited from his grandfather, a Norwegian woodworker who immigrated to America and built a series of farms in Wisconsin, culminating in a beautifully crafted farmhouse now known as the Veblen House of Minnesota, where Oswald's father and famous uncle Thorstein grew up. Veblen's interest in buildings was surely further nurtured during his graduate and post-graduate years at the University of Chicago from 1900 to 1905, a time when great Chicago architects like Louis Sullivan and Frank Lloyd Wright were influencing the future of architecture worldwide. 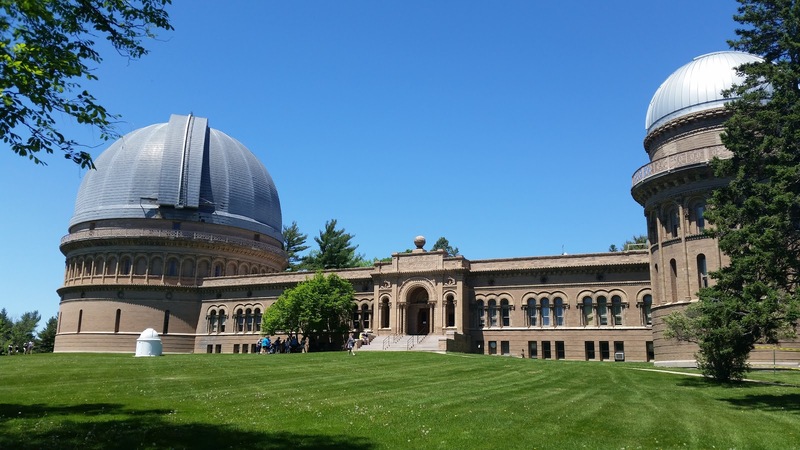 One building that may have caught Veblen's attention was Yerkes Observatory, built in 1897 by the University of Chicago. When Einstein traveled to America in 1921, this is one of the places he visited. Located safely beyond the reach of big city lights, two hours north of Chicago in Williams Bay, Wisconsin, it was a revolutionary building in its time, combining telescopes with research and lab space in the same structure. Called "the birthplace of astrophysics," it still holds the largest refracting telescope in the world. Like the Institute for Advanced Study, whose beginnings and growth Veblen would greatly influence 30 years later, Yerkes was an elite academic enclave surrounded by nature on the outskirts of a small town. It happens to be where I grew up, my father having been an astronomer there, and director for a stretch. When the University of Chicago closed Yerkes Observatory earlier this fall, it became like Veblen House, a historic building dependent on a nonprofit to imbue it with a new vision and a new life. That's when it occurred to me to look more closely for a connection between these two legacies. That connection comes most clearly through astronomer George E. Hale, founder of Yerkes Observatory and faculty member at the University of Chicago from 1892 to 1905. Born 12 years before Veblen, in 1868, Hale seems the very sort of kindred spirit Veblen would have been drawn to during their overlapping years at the University of Chicago. An extraordinary visionary, Hale had already founded a world-class observatory and would go on to found two more. Wikipedia describes Hale as "a prolific organizer who helped create a number of astronomical institutions, societies and journals. Hale also played a central role in developing the California Institute of Technology into a leading research university." A "prolific organizer" who "played a central role"? Veblen's legacy is often described in similar terms. Apparently combined with a deep-seated love of nature in every form was the spirit of the pioneer, whose greatest joy is the adventure of starting with little and taking an active personal part in every phase of creation and growth. My dear Professor Hale:- It may surprise you to hear from me at this place, but I am here very largely as the result of a letter which you wrote some months ago on my behalf, though this is not the assignment I had in mind when I requested that favor of you. However, it is a most interesting place to be in. A great deal of work is being accomplished here, as you are doubtless aware, but the office is short of men competent to handle the complicated problems involved in the study of the flight and rotation of projectiles, and the work is held up on that account. The problem is one that appeals particularly to astronomers, and Major Veblen who has charge of the Range Firing Section at this post has requested me to look for men who are skillful in the theory and practice of astronomical computing, and has authorized me to endeavor to secure their service. The matter is one of exceptional urgency. I have only a good report for Veblen. He is all that you say altho rather academic in experience and point of view. I am not sure however that this will not be an asset instead of a liability, for I know of few who give so much the impression of a sincere and distinguished intellectually competent highbrow as he. And the keynote of our song is "money for the highbrows". Though there was clear connection between Hale and Veblen at various points in their careers as they worked to advance their respective fields and science in general, it's still unknown whether Yerkes Observatory, an extraordinary edifice rising out of the Wisconsin prairie, itself informed Veblen's vision for what later became the Institute for Advanced Study in Princeton.